Raise the revenue your organization needs with either one of these two fundraising packages. Create an online account now to give your customers easier option to purchase the bricks online! Click here to access the Online Platform now. Effective for school fundraising, church fundraising, Veteran's recognition and other fundraising purposes. 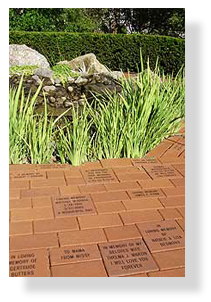 paveLok's brick fundraisers give you a wonderful combination of site beautification and community building while allowing you to raise funds for your project. The attractiveness and permanence of an installed engraved brick walkway is the hallmark of the program. People will enjoy seeing their names and their neighbors' names for years to come. The engraving can be done on a variety of materials and sizes. Engraved bricks can be used in patios, walkways, outside walls and on internal walls using a veneer brick. Granite is also an excellent media for donor recognition of your higher tier donors as are Bluestone, slate and other natural materials. Shows your committee how to easily launch your fundraising program. Provides you with proven marketing and advertising ideas and templates to follow. Please click here to read more about what will be in the Customized Program Guide. Gives you up to 5 sample engraved bricks which will be personalized for your project. These samples are great marketing tools because they have your information on them. They get your community excited about your specific project. There is a classic elegance to sandblasted glass. Very fine detail can be carved into glass using photographic masks and/or multiple depths of caring to enhance appearance. Copley Glass has helped their clients put lettering, artwork, and donor names onto large and small recognition panels, tabletops, and doors.